I am so proud of this cake! It’s been a long time in the making, I’m telling you. 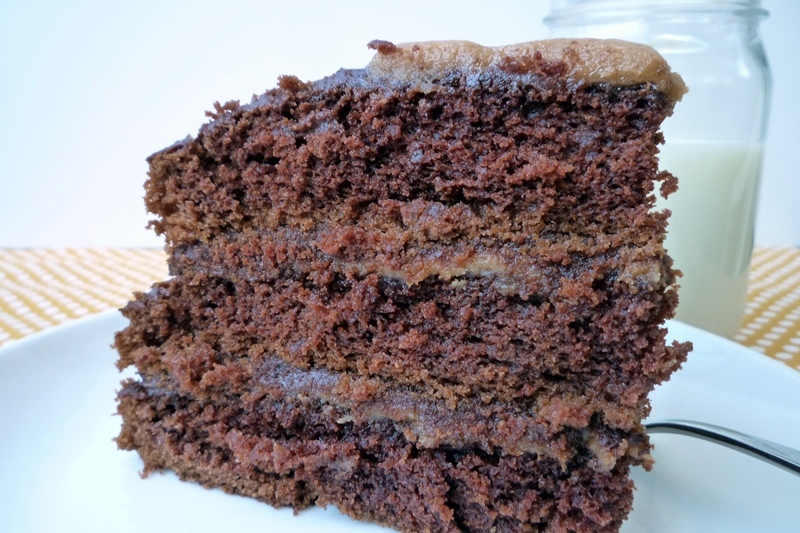 For years I wanted to make the tall, dark chocolate cake of my dreams—the towering, moist slices served up in books and movies (and my imagination). Every recipe I tried, though, left me with a general meh feeling. You know, if you go to all the trouble of making a cake, you want it to be GOOD. 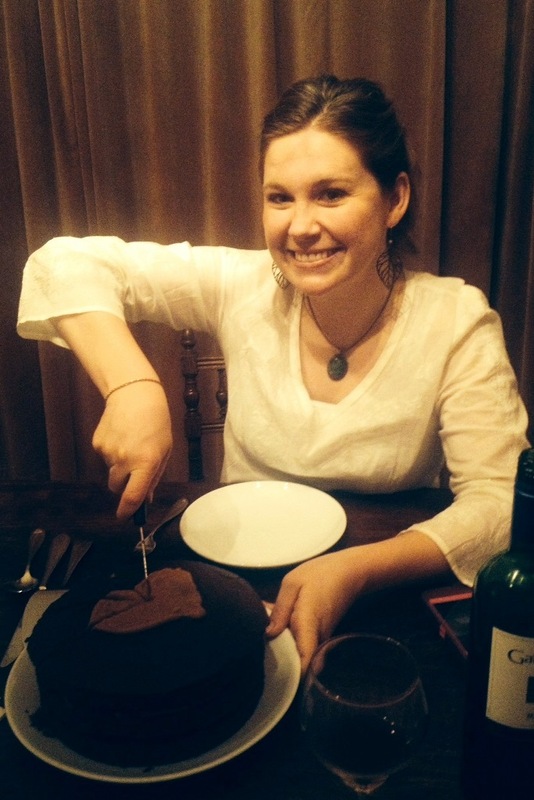 One of my mom’s best friends from long ago, who even babysat for me when I was a little one, makes a mean chocolate cake, and it was her recipe that really got me started in the right direction. My recipe is essentially hers with a few tweaks: I changed the fat a bit to include the magic coconut oil (I don’t know why coconut oil improves baked goods so much, but it does). I also increased the cocoa because I’m a dark chocolate fan. And I incorporated Ina Garten’s trick of using some coffee to bring out the chocolate flavor even more. Although the recipe calls for both cinnamon and coffee, neither of these flavors feature prominently in the cake. You can taste the cinnamon a little bit, but I can’t taste the coffee at all. Which is good because I don’t like coffee. Both flavors are there to bring out the chocolate, I think. The frosting recipe is not my own; it comes from Martha Stewart’s website. It is a chocolate ganache recipe that is then chilled to thicken it so it will spread like a traditional frosting. This is an entirely different frosting from your typical chocolate buttercream, which is made from butter, sugar, and cocoa. This is just melted chocolate with cream: YUM. If you think you don’t like chocolate frosting, you should give this a try. The frosting recipe calls for a little bit of corn syrup. If that freaks you out, you could try leaving it out. I think I remember reading some comments of people saying they did and it was fine. If you do, though, will you comment here and let me know how it goes? So that’s the story of the chocolate cake. 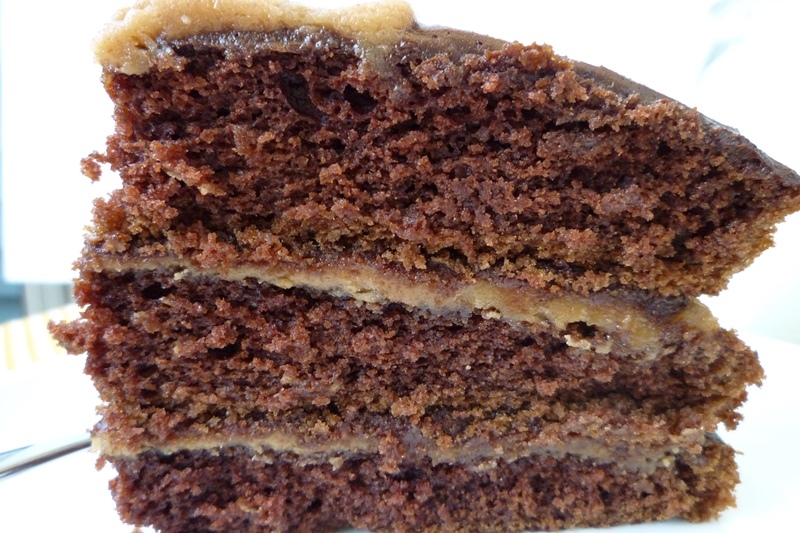 It only made its final evolution into a chocolate PEANUT BUTTER cake in the last month. A good friend of mine, sweet Emily (who has a really cute blog), was having a birthday and I was going to make her a cake. What kind? I asked. Chocolate cake, the answer. No problem! But then a little bird told me that Emily really likes chocolate and peanut butter, and so the idea started. All the recipes I found on the Internet used a peanut butter buttercream frosting, and I too almost went down that road. But I just don’t love buttercream. Also I didn’t want just a bit of peanut flavor, I wanted actual peanut butter! As in, Reece’s peanut butter cups, as in your dark chocolate square dipped in the peanut butter jar, as in absolute deliciousness. But I also worried about getting a giant glob of peanut butter stuck to the roof of your mouth and messing up your cake eating experience. I called my friend and fellow baker Aida, and she suggested I use a recipe for the peanut butter filling in homemade chocolate peanut butter balls. So that’s what I did. I started with a Wilton recipe, then I added some coconut oil, because that’s what I do these days, I thinned it some with milk to make it nice and spreadable, and I added salt for flavor. And best of all? She liked it! In a saucepan, bring butter, coconut oil, cocoa, coffee, and water to a boil, stirring frequently. Remove from heat. 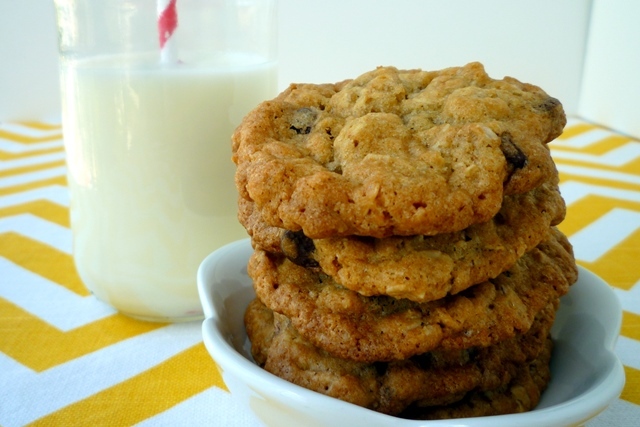 Mix together flour and sugar in a large mixing bowl. Pour hot mixture over flour and sugar and mix well. Beat in the eggs one at a time. Stir in remaining ingredients and mix until blended. Distribute the batter evenly among the three pans. Bake at 350°F for about 26 minutes, rotating pans halfway through, until toothpick comes out clean. Cool in pans on wire racks for 10 minutes, then remove from pans and discard parchment paper. Continue to cool on wire racks until cool. Then wrap in plastic wrap until ready to use. Heat chocolate chips and cream in a heavy saucepan on low heat, stirring fairly regularly, until it steams and gets quite thick. This takes a long time, about 25 minutes. Increase heat to medium low and stir constantly for 3 minutes. Remove from heat. Stir in corn syrup. Transfer to large bowl (as thin as you have to speed the cooling process; thin metal is ideal) and put in refrigerator. Stir every 15-20 minutes or so. You will see that some parts thicken more quickly than others; just stir vigorously to distribute these parts. After about 1½ to 2 hours, the frosting will be cool and thick and ready to frost. If you feel like it has gotten too cold, simply set it on the counter and let it warm up a bit. Melt together the peanut butter, butter, and coconut oil over low to medium low heat, stirring often. Once melted, remove from heat and stir in the powdered sugar. Stir until smooth. Mix in the milk until you get to a spreadable consistency. Taste and add salt if necessary. 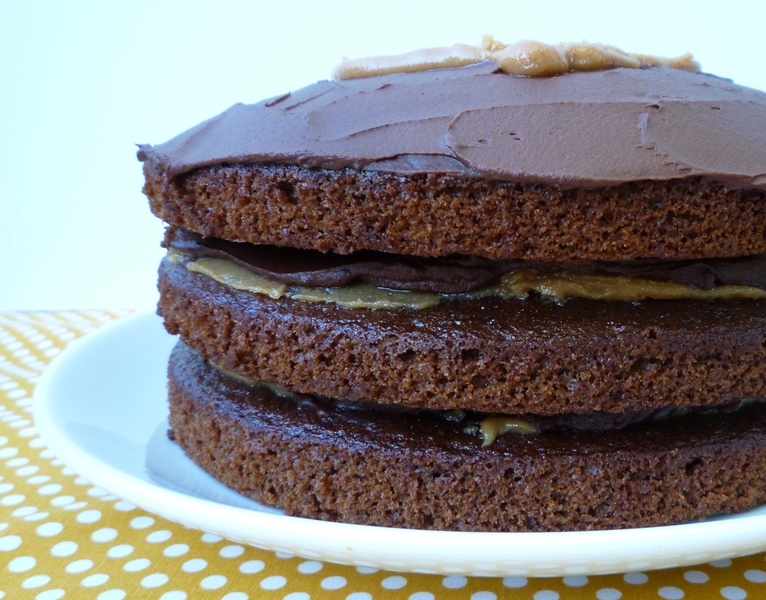 Place your first cake layer on a cardboard round or plate. 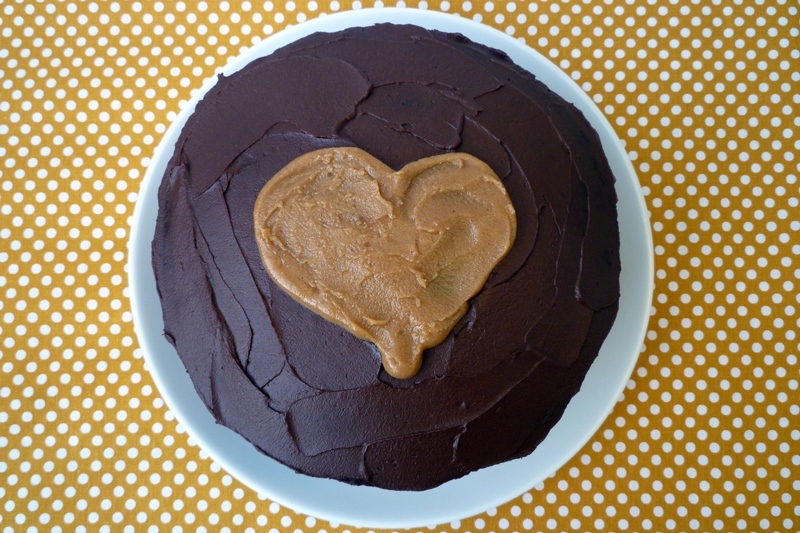 Spread approximately half the peanut butter filling on the cake, then frost with a layer of ganache. 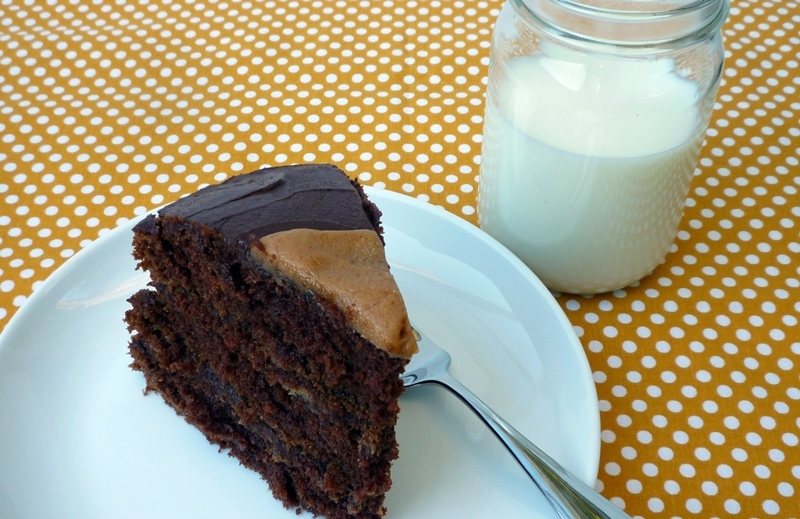 If the peanut butter filling is still warm, you can refrigerate the cake layer for a few minutes to cool it. Repeat with the second cake layer. Place the third cake layer on top, and frost entire cake (or just the top, as I did) with ganache. Use any remaining peanut butter filling for decoration, if you wish. Refrigerate the cake for 10 minutes or so to set the frosting, then store the cake at room temperature until ready to eat. I cut the chocolate ganache frosting in half because I am not a big frosting person. However, ganache freezes wonderfully and this frosting is sort of a pain to make, so you may want to make the whole batch (or even a double batch) anyway. Freeze any extra ganache in quart-size freezer Ziploc bags. When you want to use them, simply defrost them in a slightly warm water bath, turning often. Knead the bag with your hands every so often to help the frosting along. When ready to use, just snip off a tiny corner of the bag and use it to pipe the frosting on. Couldn’t be easier! I used this same Ziploc-bag-as-pastry-bag method for the peanut butter filling as well. I piped it on each layer and then used a knife to spread. This made decorating the top very easy. 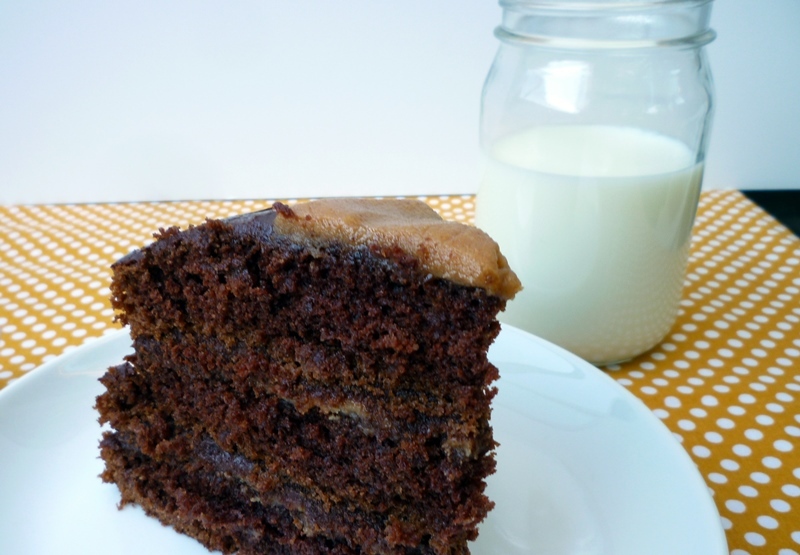 If you are making this cake for a child and want to make it less dark-chocolate-like, I would change the coffee to 1/4 cup and the water to 3/4 cup. To make your life easier, you can make the cake layers a day ahead and store in the refrigerator. Just make sure you wrap well in plastic wrap. This cake recipe can be used for other sizes. Cupcakes (makes more than 24) bake in 16-18 minutes, a 9×13 inch cake bakes in 32-35 minutes. Very yummy and creative! Love the pulling from different sources for the perfect cake! And what a fantastic picture of Emily! Woohoo!!! The best compliment a baker can get is one from the birthday girl. :) I’m so glad you liked it (and still have some left). Emily is a lucky lady!! Looks fab!